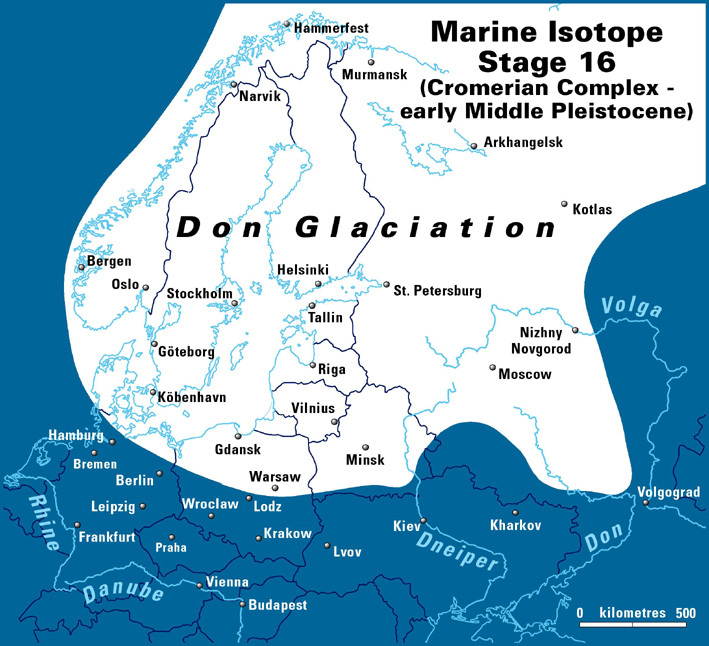 Map 3: Reconstruction of the ice sheet extent at the maximum of the Don Glaciation, Donian Stage, 'Cromer Complex' (?Marine Isotope Stage 16). (from Turner, C. 1996, A brief survey of the early Middle Pleistocene in Europe. In: Turner, C. (ed.) The early Middle Pleistocene in Europe . 295-317. Balkema, Rotterdam). In the Netherlands deposits of Interglacial III are said at some localities to overlie fluvioglacial deposits (Ruegg & Zandstra 1977). In Denmark the three known early Middle Pleistocene sites are all associated with a preceding glacial event according to Jessen & Milthers (1928). At both Starup and 01god the interglacial strata overlie glaciolacustrine clays, whereas those at Harreskov lie within a hollow on a morainic surface. In Germany, in particular, there has always been great resistance to the idea that there might be major glaciation before the classic Elsterian. However, recently Stephan (1995) suggested that a glacial tunnel valley at Leck in north-west Schleswig-Holstein may contain interglacial deposits of Harreskovian age. If that is the case, the valley ('Rinne') must have been excavated by an early Middle Pleistocene glaciation. At Elm, north of Hamburg Goedeke et al. (1966) and Grüger (1968) described an interglacial deposit, stratified between a lower, weathered and an upper fresher till, both containing erratics of Scandinavian origin. Pollen analysis suggested that this belonged to the Pre-and Early temperate zones of a temperate Stage that was certainly not the Holsteinian or Domnitzian, and which they then believed was not Eemian either. The most sensitive topic is the integrity of the Elsterian Till as a stratigraphical unit. In central Germany, where two submits representing successive advances, Elster 1 and Elster 1, are recognised, there is total insistence that these both belong to the Elsterian glacial Stage and that no previous glacial event occurred in that region. The fact that this till sequence forms a contiguous spread with that in adjacent Poland, where the San 1 Till has now been convincingly demonstrated to be of early Middle Pleistocene age, is proving hard to contemplate. The conclusion that part of the Elster Till sequence must be of the same age seems inevitable and raises questions about the age of pre-Holsteinian or pre-Hoxnian till sequences farther west. (from Alekseev, M.N. 1996, Possible 'Cromerian Complex' equivalent sequences in the Russian Plain. In: Turner, C. (ed.) The early Middle Pleistocene in Europe. 273-277. Balkema, Rotterdam. The stratigraphical position of the Don Till, sandwiched between the interglacial sediments of the Ilynian Complex below and those of the Muchkapian above, enables these glacial deposits to be attributed with certainty to the early Middle Pleistocene (i.e. 'Lower Pleistocene' in Russian usage) (Krasnenkov et al. 1984). They might, therefore, be correlated with fragmentary till deposits recorded within the 'Cromerian Complex' of Western Europe (Turner 1974). More precisely, critical evidence from small mammal faunas shows that the Don glaciation occurs within the timespan of the Late Tiraspolian mammalian complex, a timespan which, it is also important to note, is characterized by the first appearance in the Russian Plain of the genus Mammuthus (subgenus Mammuthus) trogontherii trogontherii (Dubrovo,1975, 1985) and its concomitant fauna of large mammals. Deposits associated with the Don Glaciation include lodgement and ablation tills, as well as a series of glacio-lacustrine sediments. Within the tills granites (about 60%) dominate the boulder fraction. The presence of Shokska quartzites and rapakivi demonstrates that Scandinavian province was an accumulation centre of the Don Glaciation. Another important effect of the Don Glaciation was the re-orientation of river systems to their present pattern.